Optimizing your chiropractic website for local search engines is critical to attracting qualified, conversion-ready visitors. Most likely, you’ve already heard of the “big three” – Google, Yahoo, and Bing. But did you know that each one of these search engines has a search function that can deliver localized traffic to your chiropractic website? Local search engine listings are a great way to showcase your basic practice information. We like to call it the yellow page directory of the 21st century – except, it’s 100% free! Local search engine optimization involves specialized databases of geographic information relating to local businesses within search engines. Listings within these databases include basic information about your practice such as address, phone number, website, service hours, and even a map of your office location. Note: Search engines consider searches such as “chiropractor [city]” to be a local search whereas “chiropractic back pain” to be a generalized search. 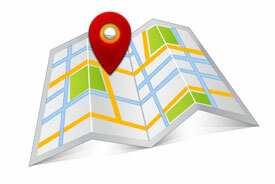 It’s imperative that your online marketing strategy focuses on local SEO. After all, attracting website visitors from San Francisco when your chiropractic practice is located in Philadelphia is not going to generate any new patients. After submitting your information you’ll be asked to verify your listing, typically via email, phone, or mailed postcard. The timeframe in which it takes between validating your listing and seeing it published online can vary from one platform to another. Among the most critical components of an effective local SEO strategy is the trinity of information known as NAP (name, address, and phone number). Search engines like Google, Bing, and Yahoo use NAP as a measuring stick for the accuracy and consistency of a business’ existence. Your phone number, address, practice name, etc. – every fragment of information about your practice must line up perfectly. For example, if you use “Court” in your street address on Google, be sure to avoid using the abbreviated form, “Ct.,” in Yahoo. Your listings should be 100% consistent across all search platforms. Why is consistency so important? There are two main reasons: 1) You may confuse search engine algorithms with conflicting information 2) You may dilute the positive impact that correct listings can give your practice. This is why at Perfect Patients we work with various data aggregators to bring conformity and consistency to the NAP listings across all search engines. If you’re not taking advantage of local search engine marketing, you’re missing out on a host of prospective new patients in your area. Adding your chiropractic practice to these search engines is a simple and free way to optimize and grow your online presence. Keep in tune with the latest online marketing trends by visiting our blog regularly and liking us on Facebook.